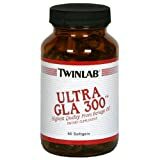 • Highest Quality From Borage Oil Twinlab Ultra GLA 300™ is the highest quality GLA (Gamma-Linolenic Acid) capsule available, derived from borage oil. Borage oil is extracted from the seeds of the borage plant and is the richest natural source of GLA. The Borage oil in this product is extracted without hexane or other chemical solvents. It uses only the cold process, “expeller-press” method of extraction, which is simply squeezing the oil out of the seed without heat. This entry was posted in Buy Supplements and tagged Softgels, Twinlab, Ultra by TOSMS. Bookmark the permalink.